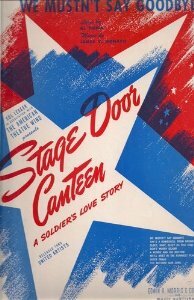 “We Mustn’t Say Goodbye” was written for the 1943 movie Stage Door Canteen and was nominated for an Academy Award for best original song. “We Mustn’t Say Goodbye” was recorded on October 23, 1959 and was released in 1960 on the album To My Wonderful One. It was arranged by Frank DeVol.